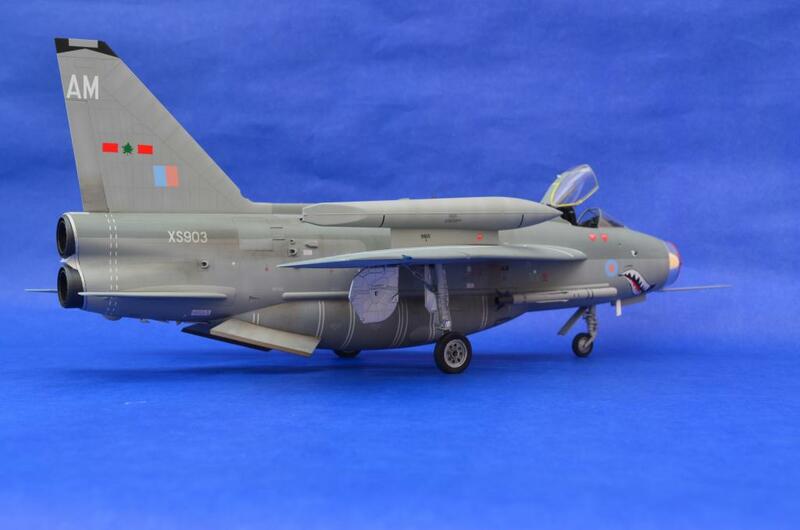 This is a recently finished project of mine – Trumpeter’s 1/32nd scale BAC Lightning F6 finished as a 5 Squadron aircraft based at RAF Binbrook in the late 1980’s. I added a few extra details to the model such as an Aries cockpit set, MasterCasters wheels and Xtradecal decals, as I felt the kit lacked in these areas. 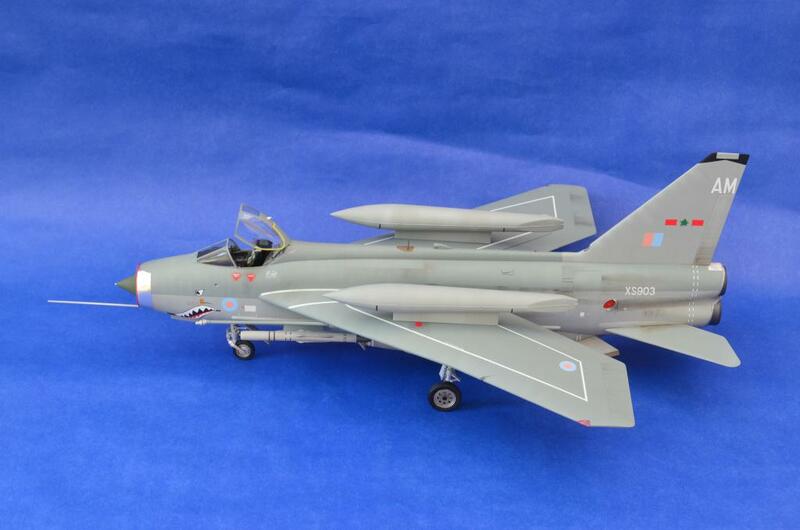 This kit does get a bad press, but looks like a Lightning to me. The only thing that I really felt like correcting was the sit of the model: the way Trumpeter have moulded the landing gear means it sits too tail high, so I simply removed 2mm from each main gear leg, pinned them, re-attached them and installed them in the bays. 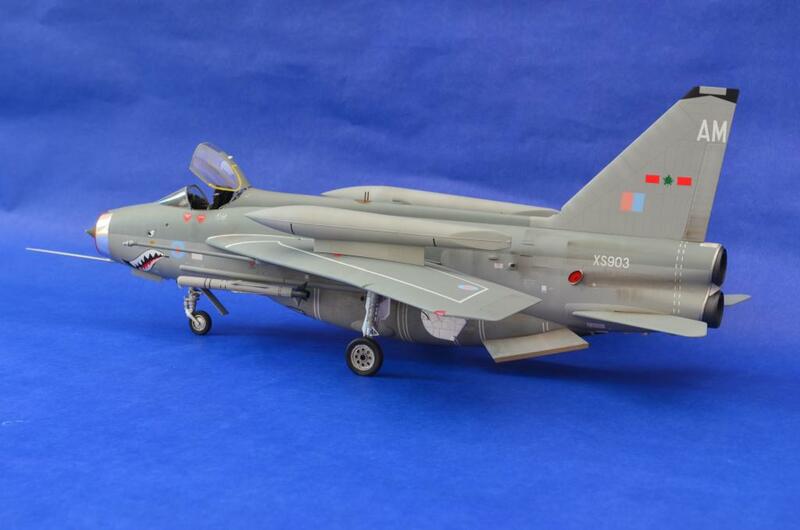 It now gives the model that distinctive, slightly tail heavy sit of the real thing. 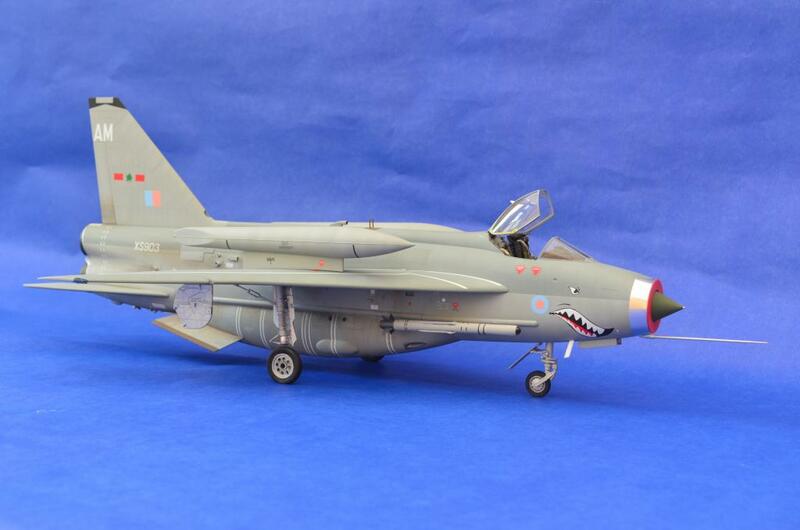 The shark-mouth was added whilst 5 Squadron was on exercise at RAF Akrotiri in Cyprus, and was short lived. I thought it added a nice splash of colour to an otherwise fairly drab scheme. 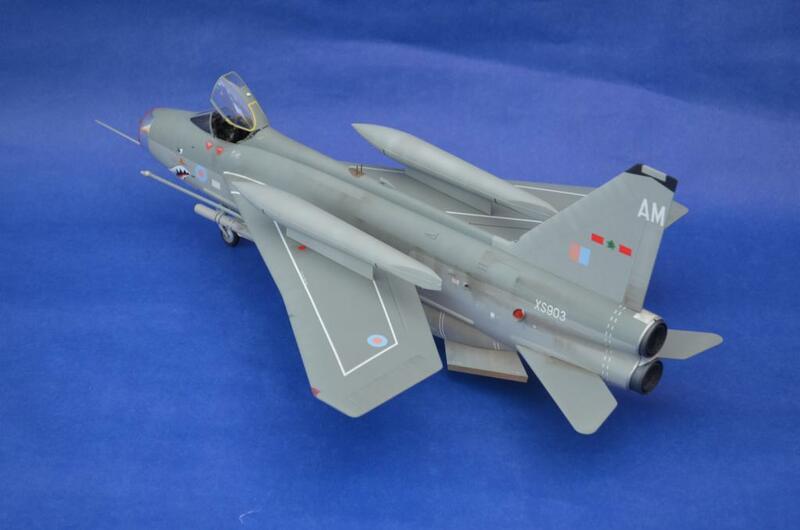 That’s, very nice work, i love the big scale jets and you have convinced me to get one, maybe both, they have been on the wish list for ages. 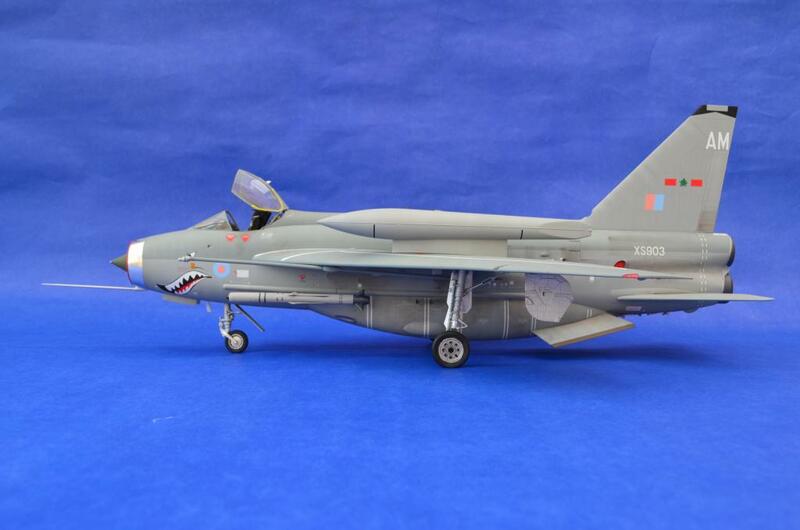 A stellar job on one of the most iconic RAF fighter of the Cold War!!! Well done!!! Maybe the kit has a bad press, but every inch (or Millimeter for me 🙂 ) of that kit looks like a Lightning and its really nice. It must be huge in this scale. 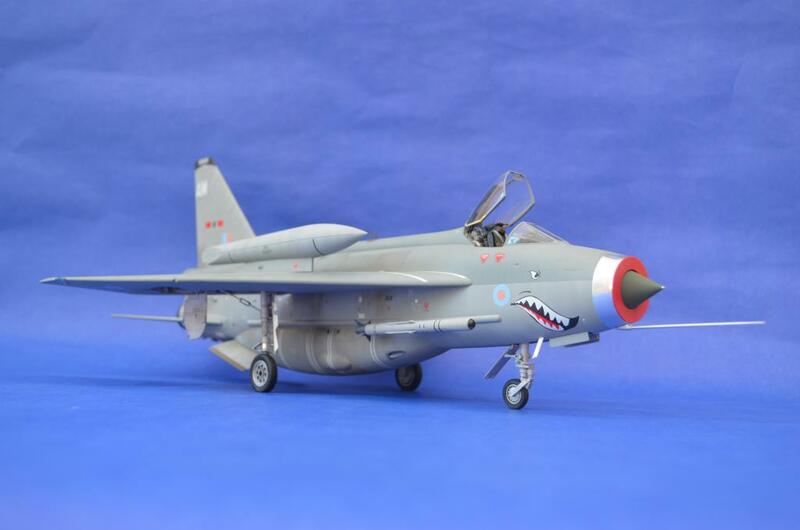 It is awesome looking, love the low vis markings, congrats! Your right it does look like a Lightning. Well done Thomas. I think you did the right thing, Tom, by just getting involved with the kit and adding a few extras. As you say, it looks like a Lightning. There’s a guy in our club who bought one of these when they first came out, and then decided ‘there was so much wrong with it’ he’d have to spend £100 on aftermarket just to make it ‘right’. Sometimes it’s easier to talk yourself out of a build than to simply make a start. Interesting to hear Rob – did the model ever get finished? I’ve heard and seen a few examples of this on numerous occasions, and sadly the builder gets so bogged down in trying to correct the perceived inaccuracies the model never gets completed! Brilliant paint job!!! The kits looks amazing! Well done. Nice lookin’ build, Thomas (and the detail on the inside of the main gear doors didn’t escape me, either – nice work). This 32nd Lightning must be a behemoth. 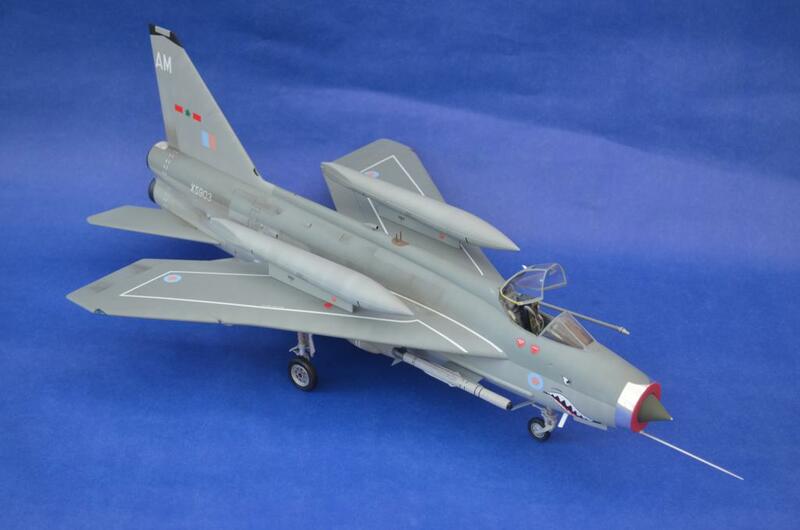 A big piece of plastic Tom, formed into an well built Lightning. Yep, it definitely looks like a Lightning, and a big one at that! Great job, Thomas. Nice work. What’s wrong with the kit other then the well publicized gap in the intake? You fixed that properly with the FOD cover. I’ve read a few articles that state the fuselage is too short, and the ventral tank too bulbous. When you compare the Trumpeter fuselage to the Echelon kit, you can see the differences. The Echelon kit is by far the best ever kit issued of the Lightning, it’s just they’re hard to get hold of these days. 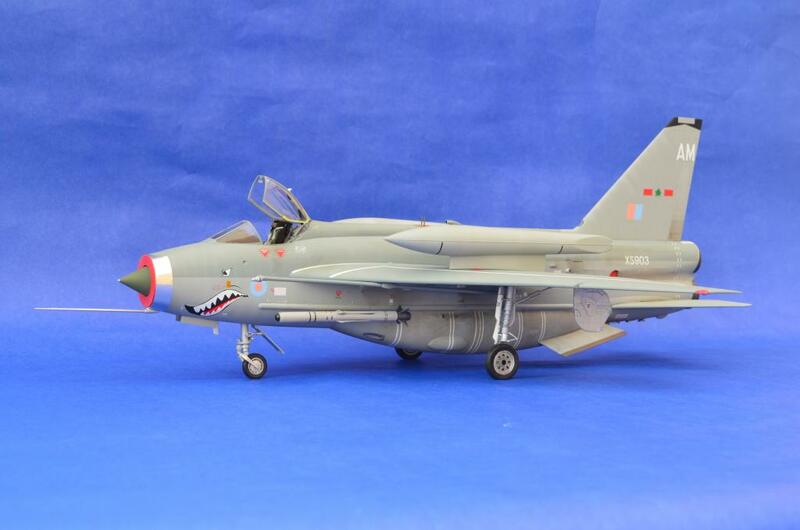 Others have commented that the rear fuselage around the jet pipes is too pinched, with the dip between the engines at the rear being too pronounced. However, as I said in my opening post, when build it looks like the subject it’s supposed to, and that’s good enough for me! That is great Tom. I too like big scale planes.I bet it looks good on the shelf.Very good pics. Thanks for sharing.